Anamorphic Looks Matte Box friendly filters with variously measured bokeh shaping elements - Petite, Medium & Large. Each filter designed with a top/bottom notch for adding Flare/Streak filament. The Flare/Streak Filter Frame is designed with multiple notches around the frame for use with various filaments. Years ago we created the very first professional Anamorphic Looks filter kit; The CineMorph Filters by Vid-Atlantic. Before this the only other way to achieve an anamorphic look was to use expensive and complex focusing lens systems. Now at the request of many professional independent and studio level filmmakers, we've introduced a 4x4 and 4x5.65 CineMorph set for matte-box systems. Sets include FOUR 4"x4" or 4"x5.65" CineMorph (Anamorphic Looks) Filters, each with a varying size anamorphic bokeh shaping element; Petit, Medium, Large and a Flare/Streak Frame. The Streak/Flare Filter Frame (available in both 4x4" and 4x5.65" sizes) is designed with multiple notches all around the frame for use with various filaments. The filters are designed to allow the user to add various gauges/sizes of flaring & streaking filaments of their choosing. PLEASE NOTE: Flare/Streak filament not included - You can easily find various filament material in hardware stores, craft shops, etc. Q: How do I add flares and streaks? A: After achieving a compatible bokeh effect with your lens and camera setup you can then add nylon or other optical filaments to the filter by wrapping it around the top and bottom notches that are specifically cut into the filters by design. Many people use different gauges of fishing line to achieve a flaring effect. Q: Which lenses are compatible? 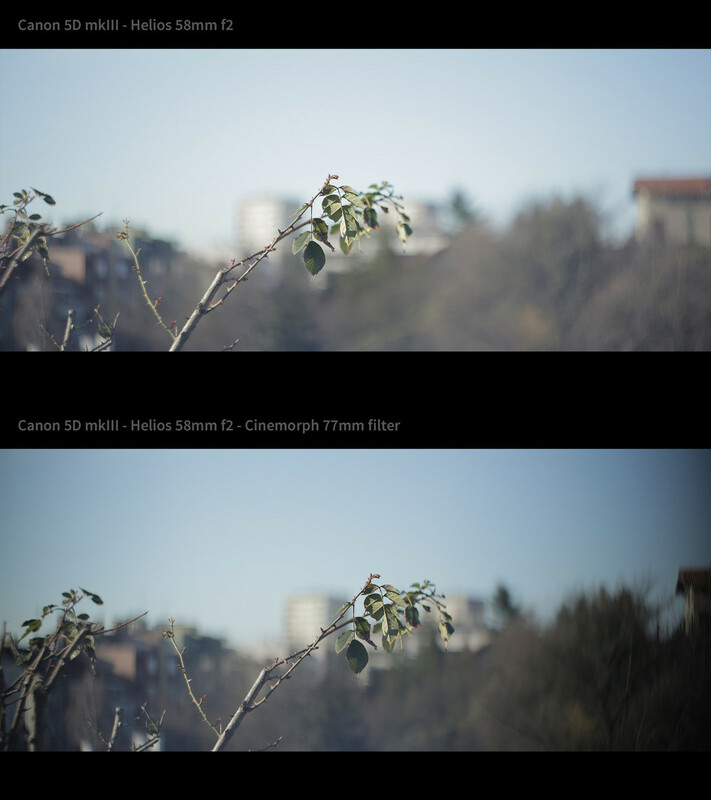 A: Firstly, like the original CineMorph filter we recommend using medium to tele focal lengths (50mm or tighter) with apertures in the f0.95 to f2.8 range. 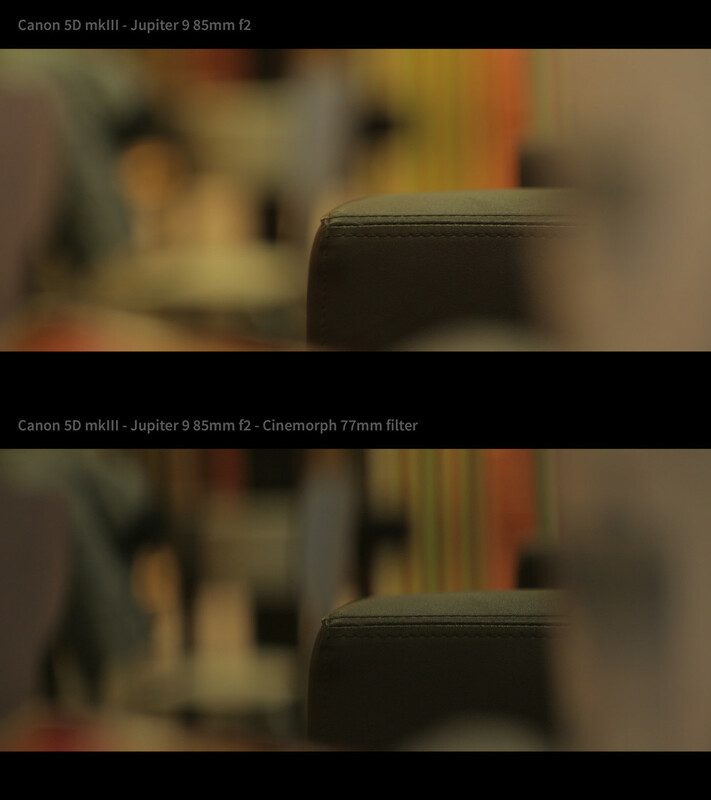 The optics on wider focal length lenses do not take kindly to bokeh shaping and vignetting can occur. Secondly, due to all of the many camera, sensor (crop factors) and lens specifications available to us as filmmakers these days, we are not able to test all of the variables and combinations. We can not guarantee which lens systems will or will not work. Q: I'm seeing vignetting when using these filters, what can I do? Avoid wide focal lengths. Please use medium to tele focal length lenses. Try switching to a larger filter size in the kit. Adjust the distance of the matte-box and filter. If possible use a lens with a smaller sized front optic. Adjust the crop sensor setting on your camera if possible. If vignetting is minimal then please crop past it in post-production if possible. If none of these options work then the current lens and camera combination that you are using is not compatible with the filters. We can not guarantee which lens systems will or will not work, but please hold on to the filters for future use with a more friendly combination. These filters are low cost bespoke items (made to order via precision machining) that we recommend keeping in your arsenal of tools for use on various camera/lens setups whether it be smaller SLR lens or larger Cinema lenses. C100 with the CineMorph by Andrew Bradford. 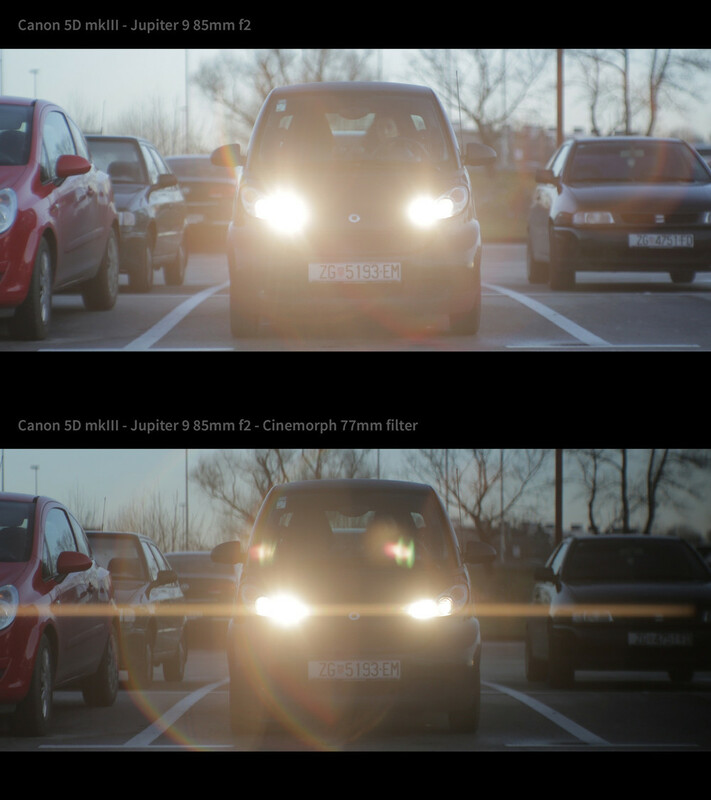 Before and After CineMorph (Anamorphic Looks) Filter images.